Utilising core LED technology from the Chroma-Q® premium performance lighting range, the multi-purpose fixture is ideal for a wide range of applications and provides a powerful, creative lighting tool. The Color One's custom optical design and fully homogenised output provides a smooth, uniform and defined 18° beam, with outstanding colour blend across the spectrum and no unsightly colour separation shadows. This makes the Color One ideal for use as a front and backlight with clean shadows, and an uplighter with a smooth, even beam - all from ONE source. The Color One's huge RGBA colour-mixing palette delivers outstanding colour blend across the spectrum - including deep-cold blues, red-hot lava looks and super-soft pastels - as well as a complete range of whites - all from ONE source. With RGBA colour mixing providing a high CRI of 93, the fixture can achieve extremely accurate colour matching. 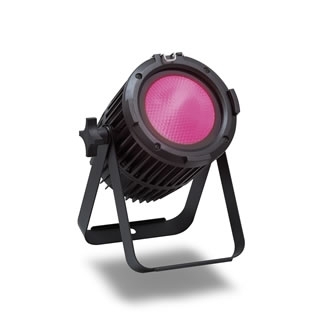 With the advanced feature set also including convection cooling for near-silent operation, a versatile mounting yoke and a choice of IP20 / IP65* models, the Color One 100 is suitable for numerous entertainment lighting applications - complementing the popular Chroma-Q® Color Force™ and Inspire™ LED fixtures ranges. With a simple to use Infra-Red remote control included with each fixture, you can be up and running within minutes without the requirement of a lighting console - saving time and labour with instant access to preset colours, on/off, dimming and effects. To enable maximum flexibility with users' existing production inventory, the Color One accepts industry-standard 6.25" accessories such as egg crates, barndoors and top hats. 214mm x 267mm x 232mm / 8.5" x 10.5" x 9"
406mm x 228mm x 292mm / 16" x 9" x 11.5"
(Full Open Yoke) 214mm x 267mm x 232mm / 8.5" x 10.5" x 9"